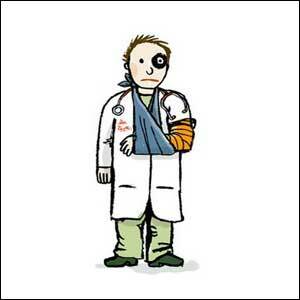 Mumbai: A doctor working with a rural hospital at Manora in Washim district of Vidarbha region was allegedly beaten up by a nurse over pending salary. The 26-year-old nurse works on contractual basis with the hospital. The incident which took place at the hospital premises on July 13 was captured on the CCTV, said police. After the incident doctor Mahesh Rathod and the nurse both have filed complaints against each other in Manora Police Station, they said. Rathod, who was beaten up by the nurse in the ward, has filed a complaint against her for obstructing a government servant from performing his duty, police said. While the nurse in her complaint has alleged that the doctor caught her hand, they said. The nurse had not received her salary since last two months and had requested the doctor to look into the issue, police said. On the night of July 13, when Rathod was on round in the ward, the nurse in a fit of anger beat him up with her footwear first and then she slapped him in front of other staff, patients and their relatives, police said. “We have received cross complaints in this case, have not registered an offence as our probe still on,” the official said.